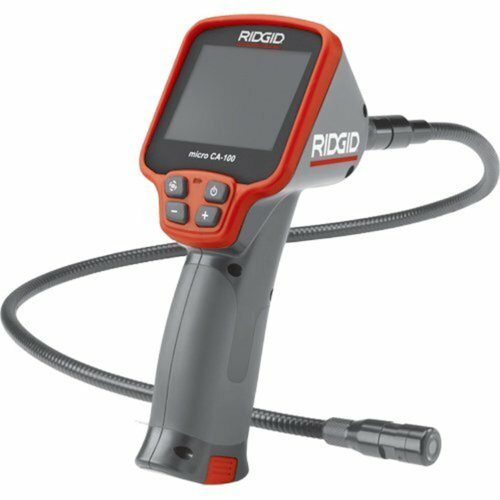 Ridgid Micro CA-100 hand held inspection camera with 3.5" acreen and adjustable led lighting to illuminate hard to reach areas. Durable, Watererproof Imager for use in almost any Environment. Video Camera with Flexible cable for viewing under, around or in walls, pipes or any area with image rotation & RCA out jack for recording. Battery operated with cable extensions currently available for up to 12' of remote viewing. 3.5" Color LED Display 3/4" camera Head 4 AAA batteries 5.5 lbs. * Please call us for any questions on our camera ridgid micro inspection rentals in Portland OR, Gresham OR, Milwaukee OR, and surrounding metro area.